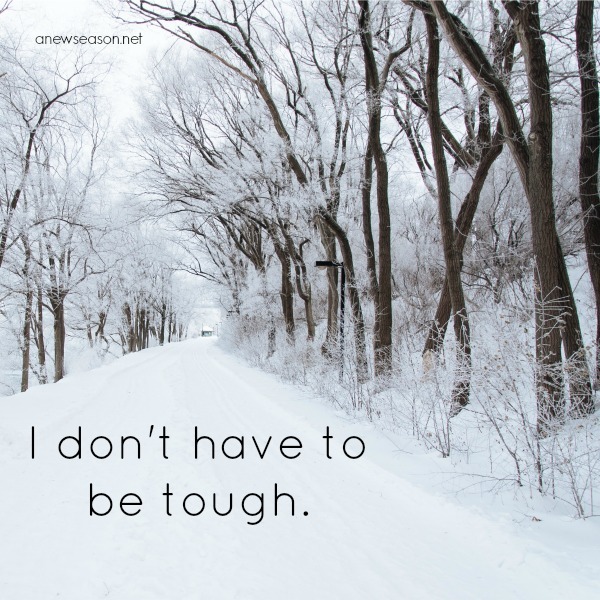 I don’t have to be tough. I got up early, showered, straightened my hair, and overall just looked cute. I thought about corporate worship, and couldn’t wait to be with the church. What snow? I’d be just fine. A southern girl living in the midwest is bound to have some angst about five months of winter (as I’ve noted before), but I feel like I’ve conquered many of my snow issues. I’m not afraid to drive in it; I think I can handle a snowy road like a champ these days. I’ve learned to accept it, dress in layers, and buy thermal socks. Therefore, when the forecast called for a blizzard, I was not alarmed. Well, until I got stuck, that is. The wheels spun, and the engine revved. But it was just a show. Hmm, that was futile. First action step, call a friend, of course. A true gentleman, he offered to come get me. Meekly, I accepted. In the meantime, I shoveled with determination and perhaps stubbornness. At least I could get it back in the garage, right? I’ll spare you all the grizzly details, but I ended up wet, freezing, covered in snow, mad, crying, and no closer to getting the car unstuck. The wind was unforgiving, hurling snow at places I’d already cleared. And you can forget that lovely, straightened hair. Tears stung my face. I was angry I no longer had a husband to take care of such things. I was angry I couldn’t do it, and angry I had to ask for help. When I called my friend back, I felt like an incapable wimp. “Ami, you’re being ridiculous. I’m coming to get you,” my guy friend calmly replied. Tears formed again, yet these were full of gratitude. I’m strong in many ways, but it’s okay to admit my weaknesses. I am weaker in physical strength than men, but that’s not a bad thing. So, here are the lessons. “Weaker vessel” doesn’t mean it’s inferior or any less valued. Rather, it is to be protected, esteemed, more highly valued. That’s a difficult thing for widows to hear. “Who’s protecting me now? Who is doing the nasty work? Quite frankly, I have to do it a lot these days, “ my heart cries. Yes, that’s often true, but it’s okay to ask for help. Sometimes it’s even needed. I know that’s a challenge, but people may not know the need until we ask. While Peter is speaking specifically to husbands in the verse above, there’s broader application within the church. Men can still honor the women around them with appropriate boundaries. More importantly, Christ already did the nastiest of work. He already provided the ultimate protection. What’s a little snow compared to my need for salvation? When I remember my ultimate weakness, it more drastically contrasts His ultimate strength. Being cared for is a lovely thing. I miss my chivalrous husband dearly, but I’m thankful God still puts chivalrous men in my life- family, friends, pastors. I’m thankful for men who help with home repairs, lift heavy objects, and pick me up in a blizzard. I’m most thankful for Jesus, the ultimate chivalrous man. Well said. Thank you for sharing this story.